The Fibers Texture node defines a procedural Fibers texture. Img A procedural Fibers texture. Drag the Fibers Texture icon into the Node Graph. 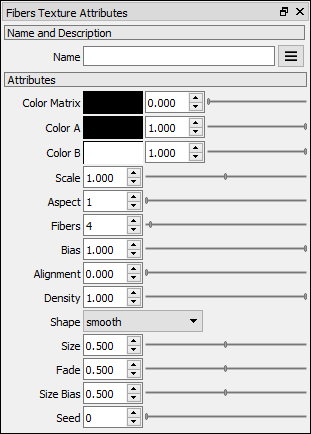 Adjust the attributes of the Fibers Texture node. Procedural textures are not displayed in the Image Viewport. To preview procedural images use the Texture Preview window, and to convert them to raster images use the Render Texture node. A procedural texture that applies color to the regions not covered by the fibers. The matrix is the matter in which the fibers are contained. The color of the matrix. The matrix is the matter in which the fibers are contained. The color A of the Fibers texture. The opacity A of the Fibers texture. The color B of the Fibers texture. The opacity B of the Fibers texture. The scale of the Fibers texture. The aspect ratio of the fibers space. By default this aspect ratio is x:1 y:1 z:1. Aspect controls z. Number of fibers per line. Amount of deviation of the size of the fibers in a line. Amount of alignment of the fibers to the XY plane (z=0). The density of the fibers on the volume. The shape of the individual fibers. smooth: The fibers are interpolated with a smooth function. box: The fibers are elongated boxes that fade into the matrix. cylinder: The fibers are elongated cylinders that fade into the matrix. The size of the fibers. This value affects only box and cylinder. Width for box and radius for cylinder. Each fiber is contained in a box space. A value of 1.0 means that the fiber occupies the whole box, 0.5 means it occupies half of the box. The amount of fade of the fiber into the matrix. A value of 1.0 means that the fade region goes from the outer radius of the fiber to the end of box it occupies. A value of 0.0 means that the fiber has no fade region. Applies a random multiplication to the fiber size. If the size is 1.0 and the size bias is 0.5 it means that the fiber sizes will range between 0.5 and 1.0. If the size is 0.5 and the size bias is 0.3 it means that the fiber size will range between 0.15 (0.5 x 0.3) and 0.5. Defines the seed of the Fibers texture.